Unless you’ve been kissed with the genes of Venus, good skin takes time. Your face, like any other part of your body, requires careful attention and maintenance to look its best. This is not limited to a daily skincare routine — though of course, that is paramount — but regular upkeep in the form of facials as well. When we think facials, we think hour-long stints of indulgence. It is not something one can easily fit into a ten-hour-a-day work week, even during a lunch break. 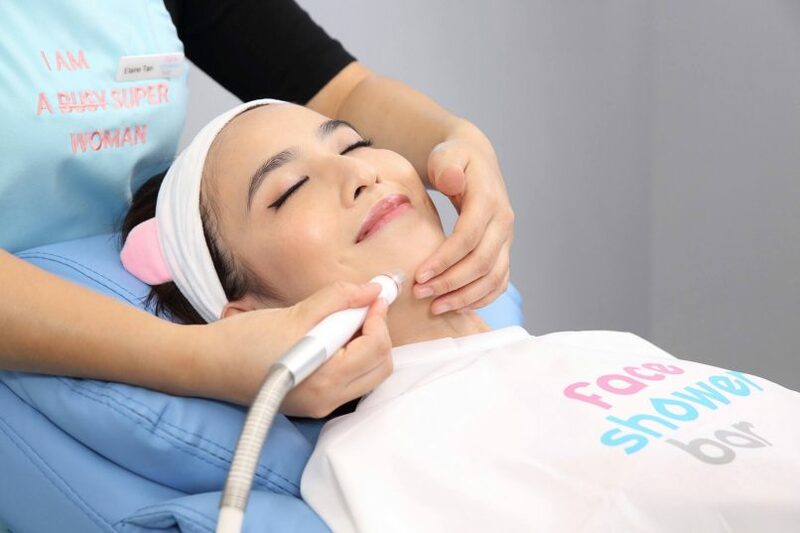 But with the opening of Face Shower Bar in Singapore, the very first boutique that specialises in fast treatments, facials are now a more accessible prospect. Step into the bar and it’s all unfamiliar. Instead of mood lighting and meditative music, you get bright LED lights, cheery slogan posters and comfortable, pastel furniture. Spotify’s Top 40 pop hits play on loop. It is the antithesis to the common facial parlour designed to pamper and lull you to sleep. A look inside the cabin. All first time customers will be tasked to fill in a speedy iPad survey on their complexion needs, before getting started with the procedure. The signature treatment, dubbed Quick Shower Facial, takes only 30 minutes, from chair to door. In that short amount of time, it promises to exfoliate, deep cleanse, and hydrate your skin. Consider us sold. The facial began with a mask cleanse, using the bar’s house-brand product. A gentle, milky face wash is applied and massaged into the skin to break down makeup, sunscreen and other impurities before being wiped off with wet cotton pads. Next came the main event: Hydradermabrasion. This technology is the reason why Face Shower Bar is able to deliver better skin efficiently. 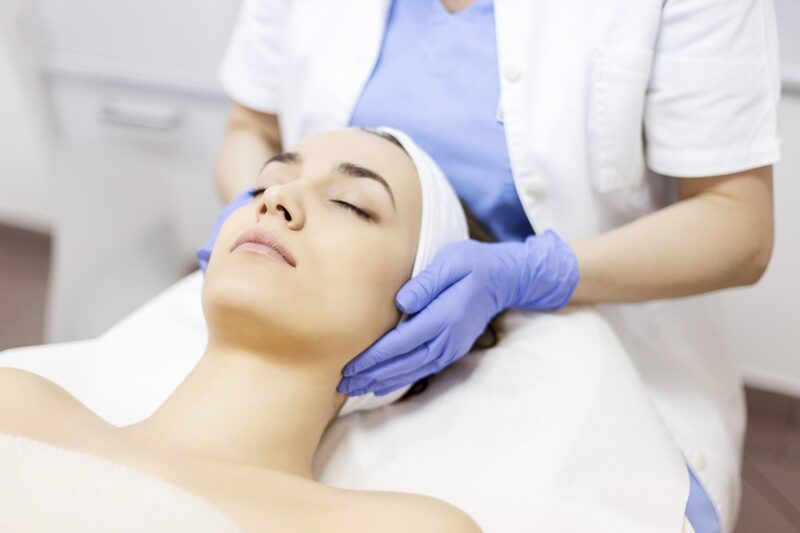 Hydradermabrasion uses pressurised water to deliver a power wash to the skin, at such a strength that water alone is able to remove dead skin and unclog pores. Each Quick Shower Facial gets three renditions of his technology. Think of them as phases that target different problem areas. For the first phase, you experience a gentle liquid wash of the skin through a nozzle. This is meant to soften your dead skin cells before the next phase — extraction. For anyone that’s been to a regular facial, the memory of an extraction is enough to make you sweat a little. It is the world of pain amidst the advertised tranquility, and a necessary evil at that, since there aren’t many ways you can rid your skin of blemishes, than at the hands of a formidable therapist and a needle. At Face Shower Bar, extraction is broadcasted as painless, because it deploys a liquid-based solution and suction technology to eradicate all the pesky closed comedones and blackheads that have taken root. We didn’t find it to be totally agony-free since the therapist had to use some pressure on problem areas, but in comparison to past experiences, this was a breeze. The final phase involves a soothing rinse to absolve redness or any agitation, then chased down with a sheet mask and serum application to maximise hydration. Face Shower Bar uses its own Irén skincare products during the treatment, including these serums. After half an hour in the chair, we had visibly refreshed, glowing skin with no dryness at all. It mirrors the results you’d have after an hour in a facial studio, except this experience cut the time in half. The one downside was that we didn’t see as drastic of a diminishment of closed comedones, but that’s to be expected as no traditional extraction was involved. What Face Shower Bar offers is a swift avenue for self-care, and definite results. It is so efficient that one could even squeeze a facial in the midst of a work day, and leave looking brand new. You won’t even have to worry about your makeup, as you’ll have time to reapply it as soon as your session is over, and not compromise the outcome. The bar also takes express treatments to another level — appointments are not compulsory, walk-ins are welcome, and you don’t have to commit to pricey packages just to enjoy its services.